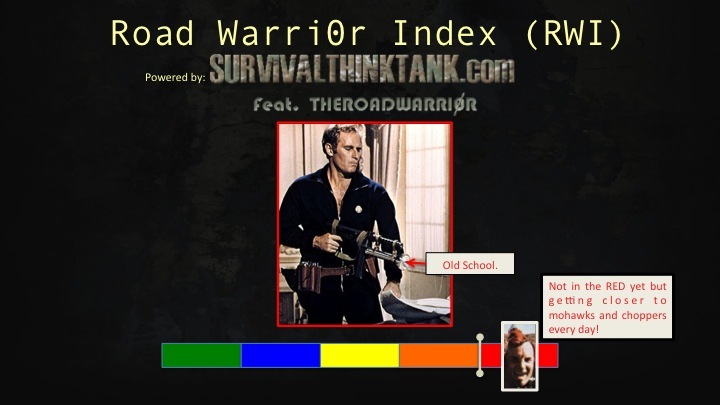 Many Believe a "Road Warrior" Depression Imminent! In a poll recently taken at Prison Planet, nearly 60% of participants believe we are headed in the direction of a Road Warrior depression. How long have we been saying this at Survival Think Tank? Misleading or downright false unemployment data comes out of the Ministry of Information, a.k.a., the Bureau of Labor and Statistics every month. The DOW and other market numbers fluctuate so often and so severely lately that it's a wonder people are investing at all. Housing and commercial real estate sectors are crumbling. How long before we see motorcycles and red mohawks in the streets? We don't know for sure but what we do know is that we are moving in the direction of a Road Warrior Depression and not away from it. In recent interviews with Gerald Celente of the Trends Research Institute we see that he is calling for gold to climb to the $2,000 per ounce (currently ~$1192 per oz) levels. Some predict even higher. When Celente talks, we tend to lend an ear here at the Think Tank. He's been right more often than wrong on some key trends. If you don't believe us, do some Googling and YouTube surfing (do your own research). The Survival Think Tank (STT) is working on a project to bust the barriers of information flow among those that want to stay out of the Matrix. One of our future projects will be a call to all STT/Roadwarri0r subscribers to participate in information source sharing and publish sources for everyone to utilize here at the STT. Ever get the feeling that you may be missing key information because you just don't know the sources that others may be utilizing? We do to! Expect a video in the future calling all of you to participate by sharing your online and public information sources. There are likely hundreds of sites that you don't know about and we are about to get this information out in the open. I came home from work this afternoon, walked in my door expecting my home to be sitting at my "come home setting" of 72 degrees F. I was surprised to be hit with a blast of greenhouse heat. I walked upstairs (even hotter on the second floor) and looked at my thermostat. It told me that the house was sitting at 90 degrees F! I walked outside to my heat pump/air conditioning unit and saw that it wasn't running. The fans were circulating air but it was not cool. I did some trouble shooting to no avail. First I had to gather supplies. I had to cut the cooler to accept the shape of the fan without too much leaking air out the side. After fitting the fan, I sealed the sides so that the fan could force air through the cooler. Now I had to drill out the intake holes for the cooler so that the fan could pull the cool air from one side of the cooler and blow it out the other. That was about all there was to it. For about $11 and ten minutes of your time you can make a personal air conditioner to keep you cool if your home A/C goes out. It's not going to freeze you out but it helps! below is the video on how it all worked out. See for yourself. In this article we would like to discuss the Roadwarri0r Index (RWI) used on our YouTube channel. The RWI has long been based on multiple data points and trends that effect our economic future. Two of these data points that we would like to address today are the market numbers (DOW and others) as well as the Bureau of Labor and Statistics (BLS) U3 unemployment numbers. The DOW and other market numbers change by the second on trading days as most of you know. The U3 is updated officially monthly (with smaller unofficial projections in between). Over the past months of analyzing the DOW and the BLS numbers we have recognized anomalies that make us question the viability of the data. The folks over at shadowstats.com are doing a great job in reporting information on the true unemployment situation in the United States, but even their venerable data is based on numbers controlled by the bureaucracy...the Matrix if you will. Here at the Think Tank, we have no choice but to drop these data points from influencing the RWI. They are deemed unreliable and misleading. The market is being manipulated on a worldwide scale (Google JP Morgan and silver manipulation for starters) and the BLS numbers are what we consider at Survival Think Tank...well, a joke. These metrics are hereby stricken from the RWI calculations until further notice.